Oi yu – yez yu - de ugly looging wuzzle with ze funnie loogink noze. Vie ar’ yu redink diz zit for? Et duz nut mean nudding! Et iz a vaste of spaze undil I can be bozered du mention du zay dat diz vilm is made by and starrink Monty Python’s Flying Circus in 1974, and zat et lazted for 97 minutez. 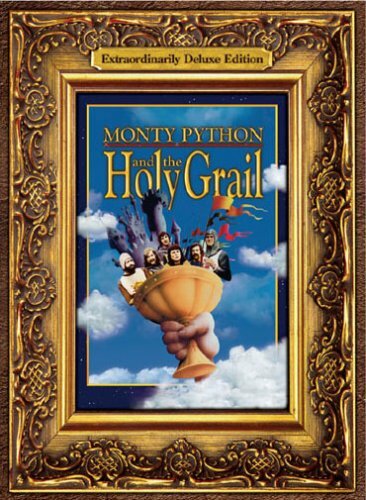 Patsy (Terry Gillingham), and his master, Arthur, King of the Britons (Graham Chapman) – I know this because he says so in this film – both rummage around the countryside looking for brave knights who will help them in there search for the Holly Grail. Now who do you think is the first person that they are able to get? Huh? Would it be the Dark Knight? No – I’m afraid not – he is a bloody loony (or a comic book character, take your pick). Instead, they befriend a scholarly Knight called Sir Bedevere (Terry Jones), and then, with him by there side, they also manage to employ the services of other Knights whom I will mention later in this synopsis. ... but decide that it is a silly place for them, and then try to find fortification in a French Fortress elsewhere. Ooops! Bad move. This French fortress is French, and after a number of taunts are thrown in there general direction, they all then decide to spit up and search for the grail individually – with Gods consent of course. The Tale of Sir Robin: Sir Robin (Eric Idle) and his minstrels delve into an enchanted forest, and are forcibly confronted by a Three Headed Knight. So what does Robin do? RUN AWAY! The git. Sir Galahads Quest: Upon spotting a Grail shaped symbol gleaming out of Castle Anthrax’s window, Sir Galahad (Michael Palin) prudently enters this ominous looking building to investigate matters further. However, once inside, a fair maiden named Zoot (Carol Cleveland), quickly deceives him, whilst at the same time treats him in a rather personable manner. Heck, Robin is accommodated in such a tempting way by these 'nice girl', that even when Zoot’s twin sister, Dingo, explains to Robin about Zoot’s ploy, he does not want to leave. But alas, Sir Lancelot saves him from this ‘temptation’. The git. Meanwhile, In Scene 24: An old man tells Arthur and Bedevere where they should look for the Holly Grail. But before anything can come of this, the Knights who say ‘NI’ force them to... gasp... get for them a shrubbery. The gits. Sir Lancelot’s Brave Daring Do: Prince Hebert is kept prisoner in his fathers Castle, until he agrees to marry a rather cubby Princess with some land to her name. Now obviously Herbert has other ideas, and he shoots a message out of the window, with the aim that this note will help him find salvation. And does he get this salvation? Errr... kind of. 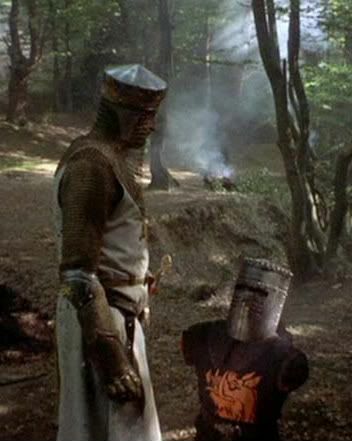 But it does come in the form of vagarious Knight, Sir Lancelot (John Cleese), whom finds this castle, chops up some of the guests in attendance, and then goes to... errr... hmm... save Herbert. You see, Sir Lancelot is surprised that this message came from a man, and he is even more surprised how Herbert’s father acts next. The git. Meanwhile Again: After a resolution of sorts with the Knights who once said Ni, Bedevere, Arthur, and all of his brave Knights, joins forces once more and then set off to find the Holy Grail together. Though, what then transpires is a rather strange set of circumstances overall. Tim the Enchanter – the Rabbit of Caerbannog – the Holy Hand Grenade of Antioch – and an animator with weak heart conditions – all of these things results in a venture full of French futility and a very modern affair. Now piss off you git. Do you know something? NI! Every time I watch this film, ‘Monty Python and the Holy Grail’, NI! Something strange happens so me, NI! Now I don’t know what that ‘something’ is, NI! I just know that it is something that does get irritating after a while, NI! To whoever is in earshot, NU! So I think it best that I try to distract my mind first, NI! With some Python related trivia, NI! OK? EKI-EKI-EKI-PI-TANG-PI-TANG! (1) Whomever in Python that was called Terry, was allowed to direct this film. (2) Most of this film was shot on location in Scotland. (3) The money invested to make this movie mainly came from people in the music industry who needed to find some tax fortifications. (4) The title sequence and some of the ‘hooded monk’ sequences; were inspired by Ingmar Bergman’s film, ‘The Seventh Seal’. (5) An initial draft of this film was spit in two, with half of it in more modern times, and the other half in medieval times. Prudently, though, the Pythons removed most of the ‘modern segments’ or translated them accordingly. (5) Connie Booth – John Cleese’s one time partner, and co-writer of ‘Faulty Towers’ – played the witch in this film. (6) One of the producers in this film, Mark Forstater, played on the police officers at the end of it. (7) The word ‘Ni’ came from the predecessors of Python, the Goons [Peter Sellers, Harry Sercombe, and Spike Milligan], and was a term used by an elderly character called ‘Minnie Bannister’. (8) The coconut thing was not in the script, but rather a more economical way of cutting down on expenses [cheep horses] and the Pythons though it funny too. (9) Comedic musician, Neil Innes, played one of the minstrels in this film, as well as helped produce some of the films score as well. And (10) The hit theatrical musical, ‘Spamalot’, is partly based on this film, and partly based on what Eric Idel wanted this film to be. Now after all of that, I feel a lot better you know! Hmm? I wonder what was bothering me to begin with? Anyway, this film – this great-great film – do you think that I like it or not? Go on, guess? As do I feel that it is: (A) A well crafted piece of sketch like material, all moulded together to make a single narrative of Pythonesque proportions. (B) A satirical illustration of British comedy at its best, which has been sculpted by five men whom are as barmy as a Goldfish. (C) One of the most seminal pieces of cinematic comedy since Chaplin made ‘The Gold rush’. Or (D) An albatross. Ha! It does not really matter what answer you picked anyway, as they are all correct – inclusing ‘D’. 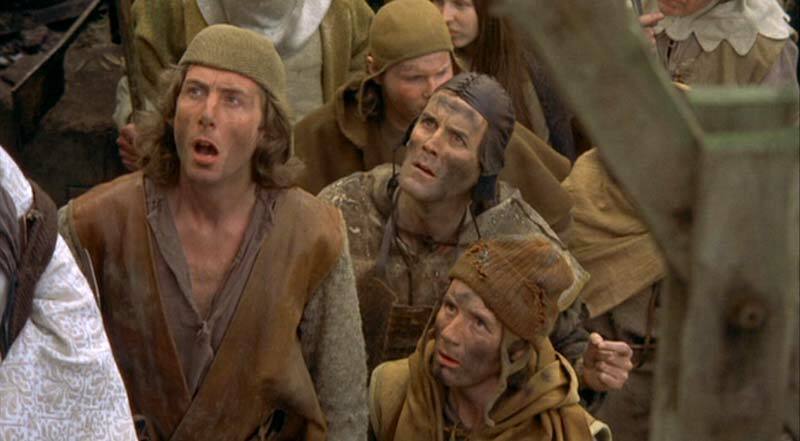 Well – what can I say – I am a Python fan – and no matter what way I look at it – even if I am pissed – I love ‘Monty Python and the Holy Grail’. It’s satirical, it tells a blatantly fragmented story, and it is just one of those films that makes me laugh every time I sit down and watch it. Now is it because I am British? Is it because I am a nut? Or is it because I just adore Python humor, and find it some of the most funniest and cleaver stuff ever cast onto celluloid? Granted, most of the Pythons work was inspired from somebody else – but that is not to say that it is not original on some level. Still, all in all this is just by the by, as this film does what a Python does – pervert – attack – and leaves you with an indelible mark that you can not shake. This great British film is for those of you who like medieval trivia, love an arcane sense of humor, and have a passion for the alternate that is one hundred percent Python. A classic film.